Despite an expansive network of rail systems, buses, and even a monorail, much of the city's 7.2 million residents don't take advantage. Only an estimated 16% of residents use public transportation, the remainder choosing to drive their own vehicles. Kuala Lumpur trains are a traveler's best friend for circumnavigating the city's infamous traffic and checking out its most compelling neighborhoods and the many things to do within them. Don't be intimidated when you first see the rail map; tickets are surprisingly cheap and the rail system is easy to navigate. Two light-rail commuter lines and one monorail under RapidKL, together with the KTM Komuter regional service and a separate Express Rail Link to the KL Airport, collectively reach over a hundred stations across the Greater Kuala Lumpur area. Most of these rail lines converge on the massive KL Sentral station, the largest train station in Southeast Asia. Beyond the KL Sentral station, integration between the disparate rail lines serving KL has been patchy: each of them were constructed under different regimes, with little thought given to integration; only recently has the government gone some way to alleviate the difficulty. Kelana Jaya and Ampang LRT lines connect at the Masjid Jamek station. Passengers can now transfer between lines at Masjid Jamek without exiting the system and paying for a new ticket. Ampang LRT and the KL Monorail connect at Titiwangsa and Hang Tuah stations. Passengers can transfer between either line at these stations without exiting the system and paying for a new ticket. Kelana Jaya (at Dang Wangi station) connects to the KL Monorail (at Bukit Nanas station), but integration has not been as smooth; passengers moving from one line to the other must exit and walk less than 1km along Jalan Ampang, and pay up again at the turnstile. More information on each line can be found at MYRapid's official site: myrapid.com.my. Tickets for each line are available at every station. The Kelana Jaya and Ampang Lines issue a blue RFID-enabled token that are sold at automatic dispensers. To enter the station, the token must be tapped to activate the turnstile. To exit the station at trip's end, the token must be dropped through a slot to activate the turnstile. Heavy users of the rail system can purchase a Touch & Go stored value card at KL Sentral to access all LRT, train and monorail systems. Tickets for the Express Rail Link must be purchased at KL Sentral; the ticket comes in a flexible magnetic card that must be inserted into the turnstile before entering the station. Depending on the destination, a train ticket costs between 33 cents and $1.50. The 18-mile, 24-station Kelana Jaya Line shows up as pink on the system map. 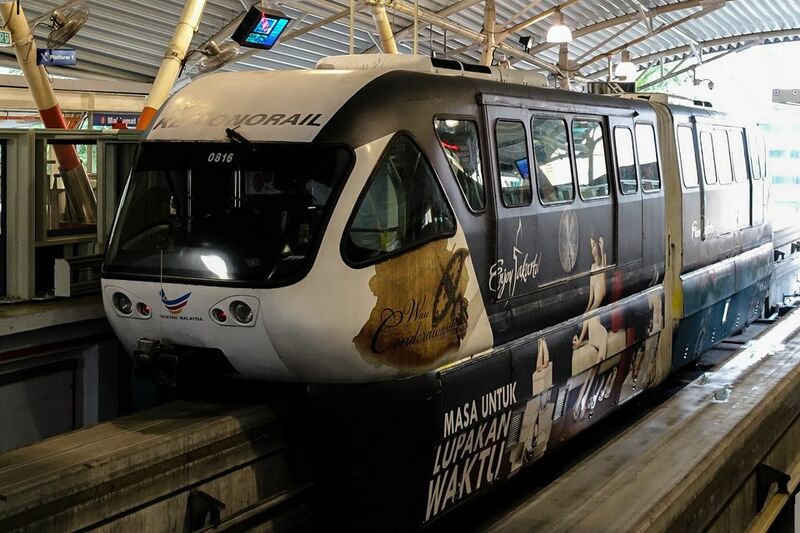 It runs through central Kuala Lumpur, allowing it to service far more of the city's prominent tourist destinations than the more utilitarian Ampang Line. Kuala Lumpur City Centre (including the Petronas Towers) is immediately adjacent to Kelana Jaya line's KLCC station. An underground walkway connects the station to the Petronas Towers and other parts of KLCC. Chinatown is connected to the rest of the city by train through Pasar Seni station. Leaving Pasar Seni station, travelers can begin exploring Kuala Lumpur Chinatown on foot; the Central Market is just down the street, and Petaling Street is about 10 minutes' walk away. Merdeka Square (Dataran Merdeka) is immediately accessible through Kelana Jaya's Masjid Jamek Station (which it also shares with the Ampang LRT line). Bukit Bintang is a major stop along the KL Monorail line: Bukit Bintang, Raja Chulan and Imbi stations welcome visitors coming for Bukit Bintang's massive shopping scene. Imbi and Bukit Bintang stations are directly connected to shopping malls (Imbi Station to Berjaya Times Square; Bukit Bintang Station to Sungei Wang Plaza). KL Tower can be reached via KL Monorail; travelers must exit at the Bukit Nanas station and walk to the tower premises. The cross-city KTM Komuter service links Kuala Lumpur with its suburbs in the greater Klang Valley conurbation. Perdana Lake Gardens lies near the Kuala Lumpur station shared by the KTM Komuter Sentul-Port Klang route (red on the system map) and the Pawang-Seremban route (blue on the system map). Find out more about the Perdana Lake Gardens and the KL Bird Park immediately accessible through this stop. Batu Caves can be reached via the Sentul-Port Klang route; disembark at the Sentul station (the last stop) and take a taxi to the Batu Caves. An additional special train runs from Sentul station to the Batu Caves, but only during Thaipusam. Travelers that arrive at Kuala Lumpur through KLIA have two rail options for getting to the city. Known as the Express Rail Link (ERL), both trains are faster and easier than making the journey by bus. KLIA Ekspres: The faster of the two options, KLIA Ekspres operates direct trains every 20 minutes between 5 a.m. and midnight to the KL Sentral station. The 28-minute trip costs $11 one-way. KLIA Transit: Also from the KL Sentral station, trains run every 30 minutes between 5:30 a.m. and midnight. The last train from the airport to KL Sentral is at 1 a.m. The journey takes around 40 minutes because the KLIA Transit makes three stops before the airport. A one-way ticket costs $11.